How do I know if my email campaign generated sales? 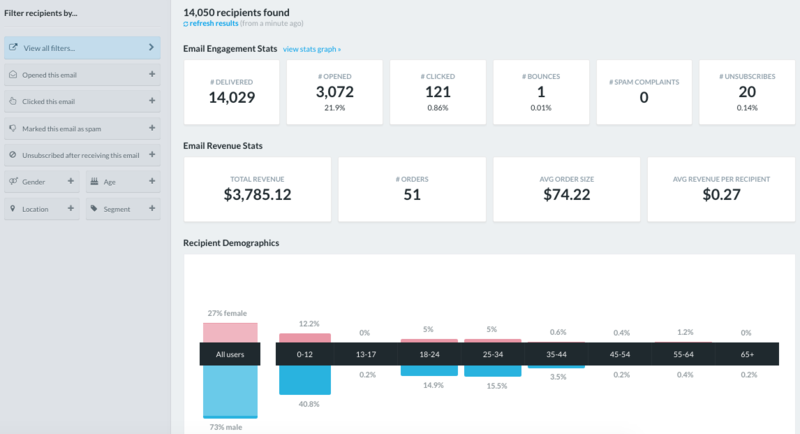 Revenue reporting gives you insight into the ROI of your email campaigns. Total revenue is attributed with a last touch model and five day window. For example, if you sent two emails in the last five days and the customer made a purchase, the order would be attributed to the most recent email they opened or clicked. The total number of orders placed follows the same attribution model as total revenue. The average order size shows the average value ($) generated per order. It is calculated by the total revenue divided by the total number of orders placed. The average revenue per recipient/contact shows the average revenue per recipient (in email reporting) or per contact (in segments reporting). This value is calculated by the total revenue divided by the number of email recipients or contacts in a segment. The average number of order per contact in segment stats is calculated by the total number of orders divided by the total number of contacts in that segment.